Mike and Paul are off to the airport in Prince Rupert to catch a flight back to Ontario early morning and we sail as they go in a very overcast sky. Not foggy per say, just a low ceiling. After a couple hours the waters start ebbing and we have a nice ride all day with speed up to 10 knots. By afternoon it is a very sunny and we enjoy the Grenville Channel in full ebb more than on the way North in the rain. 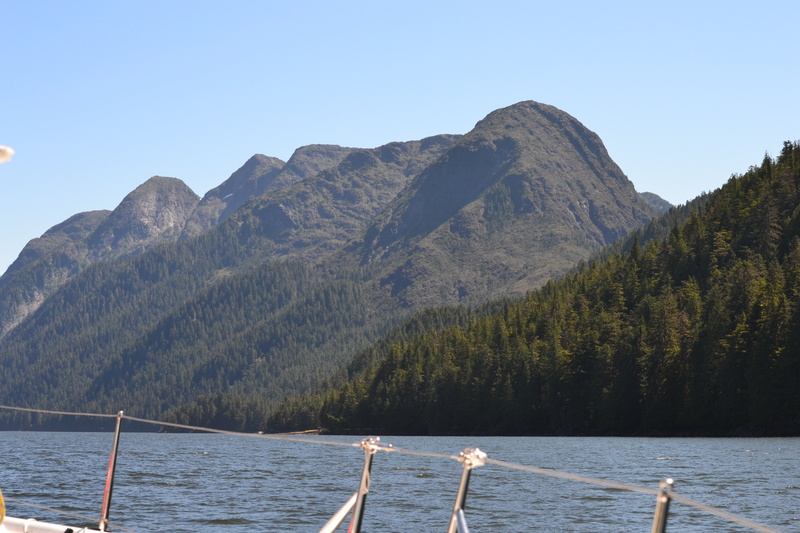 By 4:00 pm the winds really get up so we pull into Nettle basin in Lowe Inlet for the second time and anchor fairly close to the Verney Falls with all our chain down. 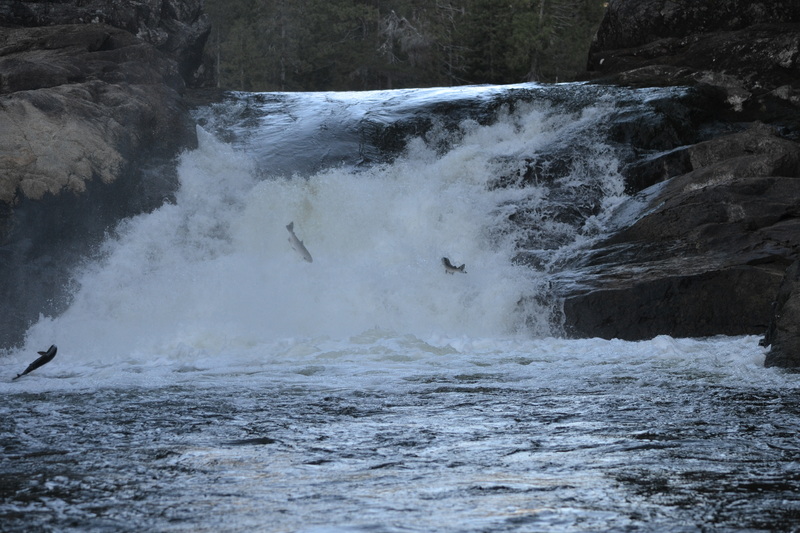 Around us there is salmon hopping constantly. We take the dinghy close to the falls at low tide and observe the pink salmon jump in their attempt to go up the Kumowdah River to spawn. 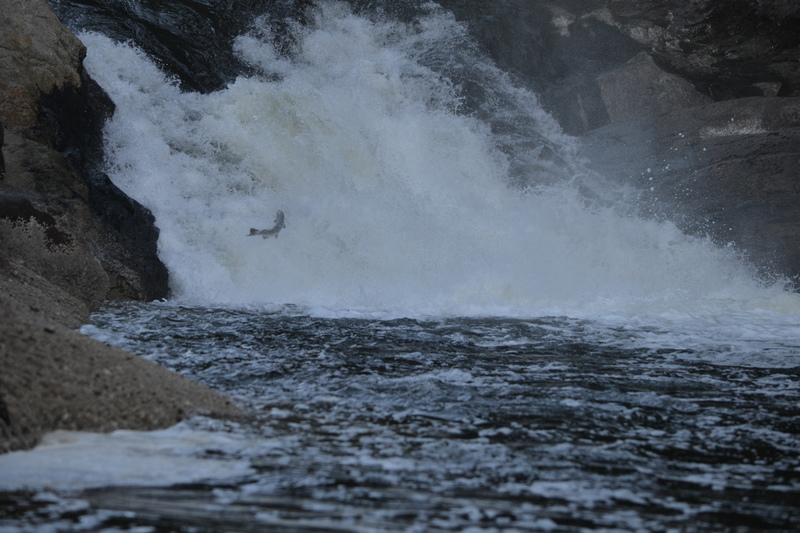 There is no fishing allowed within 100 meters from the fall so we shoot them instead (with the camera). What a sight! The only reason we finally pull away is the bugs swarming us near the falls. Surprisingly, we see no bears, they must be further up river past the falls. We are on the way home, below 54 degree latitude North and have planned longer days, weather permitting, as we are eager to get home. This entry was posted in The Log and tagged alaska, Inside passage, Mount Saunders, sailing, salmon running, Verney Falls. Bookmark the permalink. I’ve just been home a few days and I miss it already! Thanks again for a great time with old friends, and a wonderful experience.